Middle Childhood, ages 5-10, is an important stage of development. 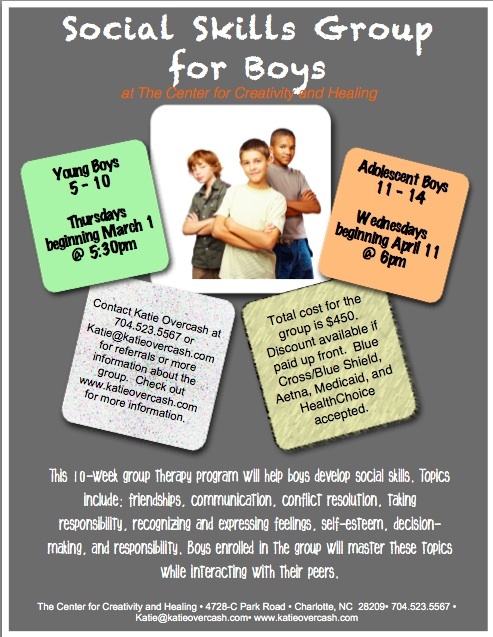 Boys in this stage start school, gain peer groups, begin to understand others, and establish their abilities that make them unique. Boys achieve social competence by exhibiting basic interaction, friendship, communication, empathy, and social rules skills. According to Erikson, children are in the stage of “Industry vs. Inferiority.” Children develop competence at useful skills and tasks. If they do not achieve competence, they feel inferior to others which affects his/her self-esteem. Six to 11 year olds make social comparisons to their peers and also have a strong desire for group belonging. Children typically have a slight drop in self-esteem due to higher expectations at this stage and the loss of their sunny optimism. Selman places children at this age group in the “Self-Reflective Perspective Taking” stage where he/she can step into other’s shoes, understand his/her feelings, and comprehend his/her viewpoint if even he/she does not have the same. Social skills are made up of interaction and communication with others. Social skills are put to use everyday. Boosting social skills for children is important at this stage of life because of their increased interactions with others, emergence of self-esteem and surge of social situations they are involved in. Social skills can increase through coaching, modeling, and reinforcing positive behaviors. If any of the above competencies are not fully met, boys’ social skills can suffer oftentimes leaving him feeling rejected. Participation in this group will foster those qualities by touching on topics such as; communication, conflict resolution, taking responsibility, expressing feelings, and more! Group starts Thursday, March 1st and continues each Thursday (except April 5th) for 10 weeks ending May 10th. Attendance at each session is required. Total cost for the group is $450. Payments can be split up each week or full payment before group is eligible for a discount. Ask about a referral discount too! Medicaid, NC HealthChoice, Blue Cross/Blue Shield, and Aetna insurance accepted. Please contact for more information. If interested please contact Katie 704.523.5567, katie@katieovercash, or fill out this survey. Berk, Laura E. Infants, Children, and Adolescents. Boston: Allyn and Bacon, 1999. Print. This entry was posted in Uncategorized and tagged adolescents, boys, communication, Conflict resolution, decision making, making friends, Peer group, recognizing feelings, self-esteem, Social skills, teens on January 3, 2012 by katieovercash.